August 2018 Edition of Power Politics is updated. 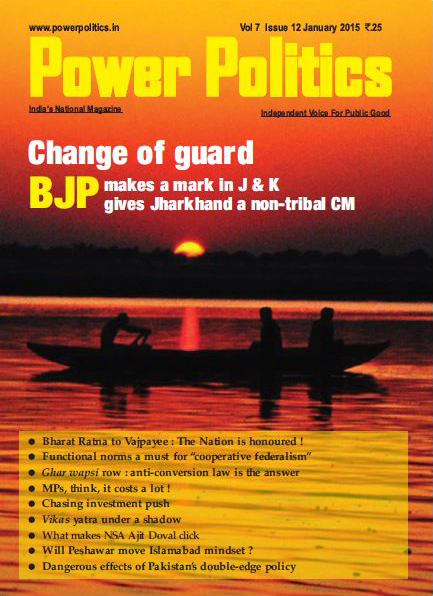 August 2018 Edition of Power Politics is updated. Snowfall is becoming rare in places like Shimla Declining apple productivity, falling hydropower generation and decaying tourist destinations, Himachal is finally paying the price of pursuing unsustainable development policies with scant concern for protecting the fragile mountain environment. The hill state is grappling with the economic fallout of the irretrievable damage being caused to the natural infrastructure, which endowed it with a huge potential for hydropower, horticulture and tourism. These three sectors, which have been the mainstay of the state's economy, are beset with multiple problems due to sharp degradation of mountain ecosystems, a consequence of unregulated, and excessive human activities in highly eco-sensitive middle and higher hill ranges. Polluted water source ! The power surplus state was forced to purchase 200 MW of power during summer as generation dipped significantly due to a sharp fall in discharge of most rivers and streams. 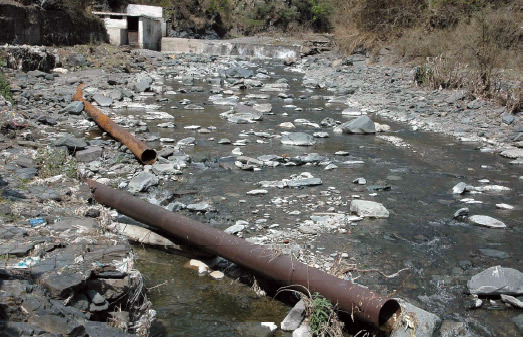 While the flow in small streams and khads usually declines during lean summer months, this year lower discharge in the state's major rivers like Sutlej affected generation in the country's largest 1550 MW Nathpa Jhakri project and 412 MW Rampur project. 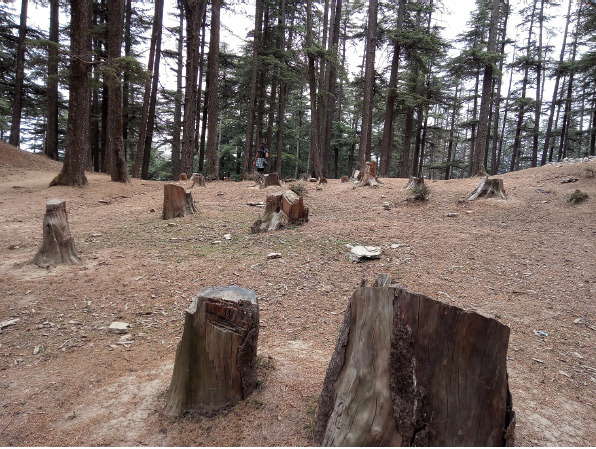 Stumps of felled deodar tree Naldehra tourist spot near Shimla The Sutlej Jal Vidyut Nigam, which owns and operates the two projects, could generate only, 2935 million units against programmed 3670 million units from April 1 to July 11. Power generation has been down in almost all the hydropower projects across the state mainly due to insufficient snow on the hills during winter. The erratic and declining discharge, a consequence of ongoing degradation of mountain ecosystems, is affecting viability of projects as generation per megawatt has come down from 5.5 million units to 3.7 million units over the past three decades. Stumps of felled deodar tree Naldehra tourist spot near Shimla While generation from the existing hydropower projects is declining, there are no takers for new projects and those already allotted are not making much progress. Despite repeated bidding the government failed to allot projects with aggregate capacity of 2200 MW as there were no takers. Work on projects with aggregate capacity of 5500 MW was virtually at a standstill and government has announced additional incentives, including deferment of 12 per cent free power to be paid as royalty for 12 years. It also made it mandatory for the state power utility (HPSEBL) to purchase power produced by projects up to 10 MW and waived wheeling and open access charges for projects up to 25 MW. The hydropower projects are no longer an attractive proposition as the cost of construction is increasing, the generation is declining. The thrust on solar power at the national level has brought down the cost of solar generation significantly and it is becoming more economical than hydropower. Hapahazard construcitons on a steep slope Indeed, man-made factors like indiscriminate deforestation, excessive constructions on steep hills slopes transforming lush green slopes into veritable concrete jungles, impounding and diversion of rivers, streams and khads for power generation and ever increasing human activity are aggravating the impact of climate change. The vulnerability of apple, state's premier fruit crop, to unfavorable weather conditions provides a glaring example. The production has been fluctuating and the yield has been declining progressively. The area under apple increased from 26,000 hectares in 1970 to 88,560 hectares in 2005-06 but productivity declined from 9 tonne per hectare to 6 tonne per hectare. The area under apple further increased to 1, 12,500 hectare over the 2005-17 period but the average yield has come down to 5 tonne per hectare. The average yield for the last six years works out to be 4.89 tonne per hectare, even though new orchards mostly have high density plantations with imported high-yielding rootstock. 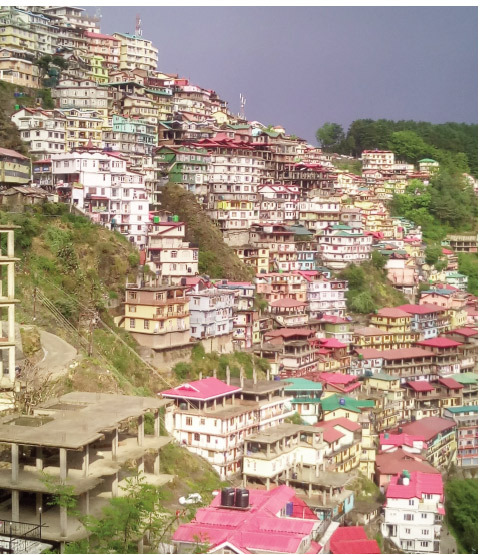 The state image took a hit and the government suffered much embarrassment early this summer when acute shortage of water in Shimla forced the residents to post appeals in the social media urging tourists not to visit the city. Water scarcity apart, the main tourist destinations are choked with vehicles and tourists and residents have to put up with irritating traffic jams. 11.This is one of the worst years and as per official estimates the production will be only around one crore boxes, lowest since 1999. The apple belt received very little snow, which is considered as "white manure" for the orchards as it helps in maintaining the required chilling temperature in winter and retaining adequate moisture in the soil during dry summer. Large scale deforestation and excessive construction on the hills, which have burdened beyond their carrying capacity, have altered the weather pattern and the lower and middle hill ranges hardly received any snow. It is a matter of grave concern as apple accounts for almost 80 percent of total fruit production of the state. 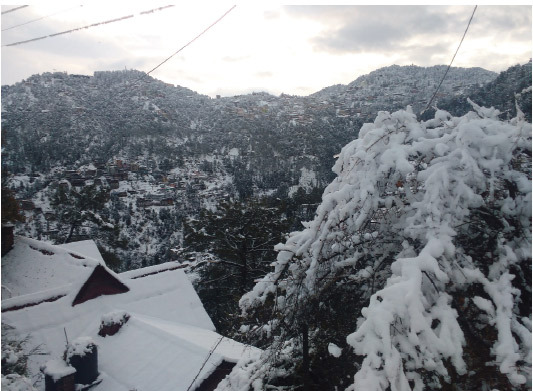 Scientists of meteorological department reveal that the snow season in Shimla has been shrinking at the rate of 11 days per decade since 1991. The decadal average of winter precipitation from December to March has also come down from 283.9 mm (1991-92 to 2000-01) to 235.1 mm (2001-02 to 2010- 11).The overall precipitation has been falling fast and rainfall data gathered by Bhakra Beas Management Board shows that monsoon precipitation (June to September) in the catchment areas of Sutlej and Beas rivers has declined by a whopping 44 per cent from 1,092 mm in 2008- 09 to 621 mm in 2016-17. The tourism sector has been the worst hit with all the important tourist destinations like Shimla, Kullu, Manali and Dharamsala witnessing a spate of illegal constructions resulting in haphazard growth. With successive governments, irrespective of party in power, aided, abetted and implanted policies to regularise illegal constructions making a mockery of the state town planning act. Not only that the government has been reluctant even to implement the orders of the court. It was only after the Supreme Court took a serious view of illegal constructions in Kasauli some unauthorised hotels were demolished in compliance of its orders. The high court has quashed the amendment to the state town and country planning act vide which illegal structures were regularised but the verdict is not being enforced and construction is continuing in full swing in Shimla and other towns. With the building laws being observed more in breach, the main tourist's towns have witnessed chaotic growth. The basic civic amenities have not kept pace as a result of which water scarcity, shortage of parking space, garbage disposal and poor conditions of roads are common problems in all tourist places. But for the repeated interventions of the courts, the situation would have been much worse. With the government not showing any positive intent to enforce the rule of law, the judiciary is the only hope. Illegal constructions in Kullu,Manali, Dharamsala, Kasauli and Shimla are already under the scanner of the NGT and cases of encroachments on forest land are being monitored by the high court.